Maharajas Express, the finest and most popular luxury train of India, has been rated as one of the top-rated trains around the globe. Deccan Odyssey reached Kolhapur in Maharashtra on Wednesday with 14 tourists. The esteemed guests of the rail tour include domestic and foreigners from United Kingdom and Germany. Maharajas’ Express, world’s leading luxury train, has won the esteemed Seven Stars Luxury Hospitality and Lifestyle Awards. One of the finest luxury train in the world, Maharajas Express is offering 50% discount offer for selective journeys of 2015. Maharajas Express – the most expensive, luxury train in the world is likely to run along Goa's tracks by next year. World's leading luxury train, the Maharajas' Express will embark on a special Departure from 23rd September 2015. 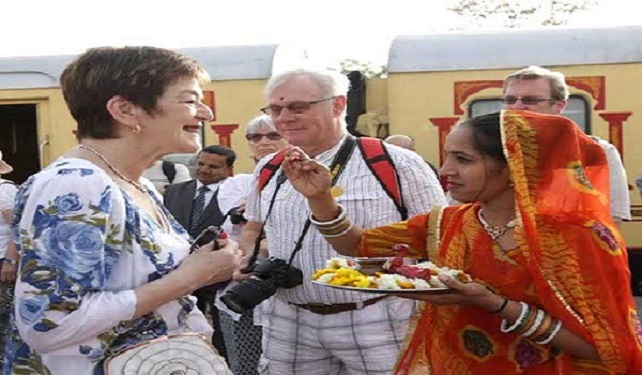 Palace on Wheels, a popular luxury tourist train of Rajasthan Tourism will soon begin with its journey from Gujarat. Come and live life Maharaja- Style now at the discounted rates you couldn’t believe. Deccan Odyssey is now offering a ride of 7 nights for Indian Citizens for the price of just 4 nights. Now isn’t this an offer that you couldn’t refuse. Grab this offer before its expiry date on 16th August 2015.